Several NHIOP Kevin B. Harrington Student Ambassadors participated in a service event On Friday, March 15 proposed by New Hampshire’s Kid Governor, Lola Giannelli. 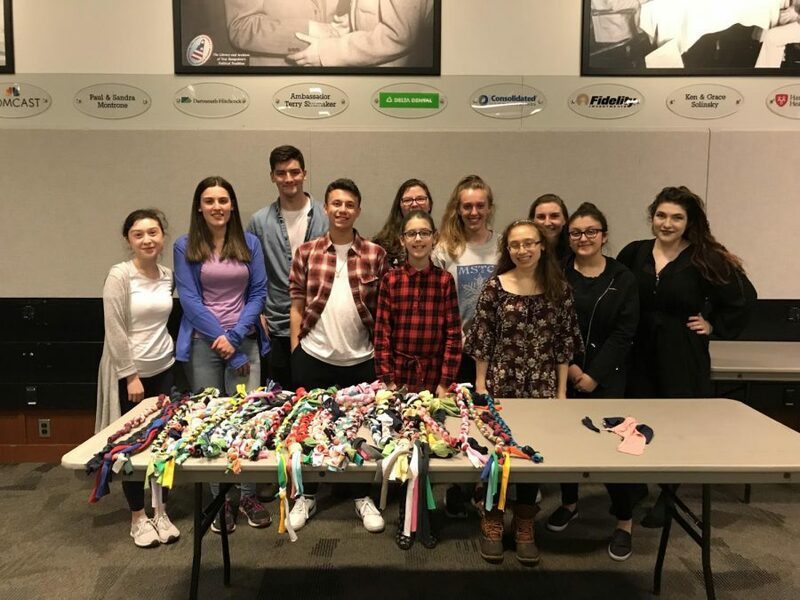 Using student-donated t-shirts that were pre-cut into long strips, volunteers braided the strips to create an assortment of stretchy, colorful dog toys. These dog toys, varying in length and thickness, will be donated to the New Hampshire Humane Society. March 15th’s event was not a one-time gig for Kid Governor Giannelli, who took office in January 2019. In her campaign platform, Giannelli, a fifth grader at Sunset Heights Elementary School in Nashua, pledged to take action against animal cruelty, and she has carried out this mission during her first two months in office. Giannelli is New Hampshire’s first Kid Governor, a civic education program started in Connecticut in 2015 and now operating in Oregon and New Hampshire. The New Hampshire Kid Governor Program is made possible by the New Hampshire Institute for Civics Education and the New Hampshire Institute of Politics, as well as the New Hampshire State House and Department of Education. 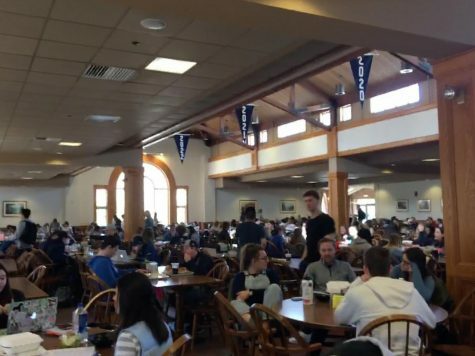 Before the event on March 15th, Giannelli spoke to the Kevin B. Harrington Student Ambassador Program’s monthly meeting about her campaign process and her plan for reducing animal cruelty in the state of New Hampshire. She started the campaign process by identifying an issue about which she was passionate: stopping animal cruelty. Giannelli explained that she “wanted to help animals” and sought “to help stop [animal cruelty]” in New Hampshire. To meet this objective, she developed a corresponding platform. She then conducted extensive research on the extent of this issue in the state to shape her action plan. This plan includes making dog toys for shelters, organizing food and blanket drives, and collecting signatures to support legislation which would require pet stores to source their pets from shelters and nonprofit organizations, rather than mills (similar legislation was recently enacted in California). She also encourages students to start school clubs for making dog toys to donate to animal shelters and for brainstorming more ideas to help shelter pets. After devising her action plan, Giannelli wrote her campaign speech, which she presented along with other candidates at her elementary school. She was elected by her classmates. Victory in hand, her next step was to create a campaign video. This video features facts about animal cruelty in New Hampshire, interviews with fellow students, suggestions for how kids can make a difference in their schools and communities, a plea to adopt pets from shelters rather than pet stores, and a reminder to alert the police when animal abuse is spotted or suspected. This video was sent to the Kid Governor Advisory Board, which selected three candidates for a statewide election. About 450 students voted on Kids Voting Day, held on November 5th, 2018. The other candidates included Ben Vachon, whose platform centered on reducing food waste and ending hunger, and Evelyn Ellis-Haines, who focused on ending poverty. Giannelli triumphed in this election and was sworn in by Chief Justice of the N.H. Supreme Court Robert Lynn at the New Hampshire State House on January 18th, 2019. Vachon and Ellis-Haines serve as her Kid Executive Councilors, and Ellis-Haines’ platform has been partially incorporated into Giannelli’s plan for the coming year. Giannelli and her mother left the New Hampshire Institute of Politics with a hefty bag of dog toys, as well as several additional bags of t-shirts to be cut and braided into more toys.